April 2018 was an exciting month for ThreeSixty, its students and its alumni. Congratulations to 2014 ThreeSixty Scholar Deborah Honore and 2013 ThreeSixty Scholar Simeon Lancaster. 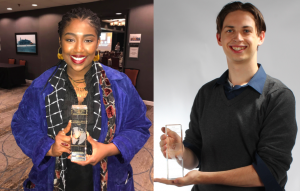 Each was awarded a prestigious Academy of Television Arts & Sciences – Upper Midwest Chapter/Foundation “Crystal Pillar” student production award. Currently, Lancaster is production assistant at PBS News Stories’ Under-Told Stories Project. Honore graduated from St. Thomas in May 2018. Also in April, ThreeSixty and TV Broadcast Camp partners Padilla and Blue Cross Blue Shield Center for Prevention won three Public Relations Society of America (Minnesota) “Classic Awards,” for summer 2017’s TV camp. The camp is offered again for the 2018 summer, and stories will center on health equity issues experienced by underserved communities. April also saw ThreeSixty and Youthprise partner for a gubernatorial candidate debate. The event, held for area youth, featured five Minnesota gubernatorial candidates and was moderated by Lancaster and 2017 ThreeSixty Scholar Samantha HoangLong, with alumna Marissa Abara serving as event photographer. ThreeSixty’s awesome April also included the Minnesota Timberwolves honoring ThreeSixty with a halftime ceremony that included presentation of a $5,000 check from the organization’s FastBreak Foundation. And, oh by the way, the Wolves clinched a playoff berth with an overtime victory that night! View video of the halftime presentation below.